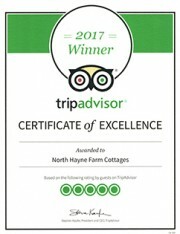 When we set out to create North Hayne Farm holidays for children, we understood that the road ahead would be a difficult one as all of the cottages had previously been converted back in 1988 and certainly not with the environment in mind! Our journey has been long and definitely not over yet! Working between ‘lets’ often in winter, in bad weather and whenever we could afford an improvement, we are proud that to date we have changed and improved many aspects of the business. Local Suppliers; Devon has an amazing heritage of producing some of the best food, our cottage information folder and the notice board in the Games Room will be full of wonderful ( and local ) ideas. Our Jackchilli frozen meals which are also available to order during our visitors stay are another great idea and a perfect way to support a local business as well as eliminating extra car miles too! In Summer 2018 we began the task of significantly reducing our plastic usage in an effort to support North Devon become free of single use plastics. The raised awareness of plastic pollution in the sea and the complete devastation it can cause to our marine life has created a need for alternatives to single-use plastic and inspired us to do better …not easy as we have found but we are determined to keep trying! 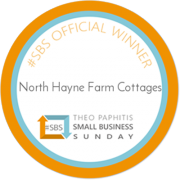 Throughout 2018 we ran a competition here at the farm to look at ways in which we could rid ourselves of single use plastics. The winner suggested equipping the cottages with re-useable sandwich wraps to avoid cling film use so we set about making our own 'wax wraps' and removing clingfilm usage entirely. Working with #PlasticFree NorthDevon and www.2minute.org #2minutebeachclean we are continuing to make changes to the way we do things in the future. In housekeeping for example, wherever possible, we now re-use as many bottles as we can, re-filling them instead of replacing them. Bin bags are made from recycled plastic, some are bio-degradable too (higher cost sadly but worth it we hope). Items are bought in bulk to reduce plastic waste and much more proactive searching goes on for ways to keep improving. Toilet rolls are made from bamboo and sugar cane and come wrapped in compostable paper rather than plastic. Our celebration season can often be a time of plastic excess. Last year we made conscious efforts to change this and all parties had a ban on plastic disposable plates, cups and cutlery and were replaced with either washable or compostable paper ones. Cling film has been replaced with foil and elasticated washable, re-useable food covers which can also be used in a microwave. Waxed papers for wrapping food up in (useful for days out at the beach perhaps?) are also available locally (our own Quince Honey Farm and Griffins Yard do some lovely ones). Our welcome cream teas now either have one of these covers or a metal/glass cloche which can be reused. The farm itself is relatively low on plastic waste, we are currently working on sourcing biodegradable gloves for our Farm Hands club. Our new Games Room and Play Barn build allowed us to create an insulated (minimally heated) warm environment for everyone to relax in and installing hot tubs rather than a large swimming pool have kept energy bills and chemicals to a minimum. In addition our latest eco cottage (Jeremy Fisher) which was completed in 2017 allowed us to build a super-efficient holiday cottage for larger families. This was an ideal opportunity to use Bio-mass heating which is one of our long term goals and something we hope to be able to one day have across the whole complex. 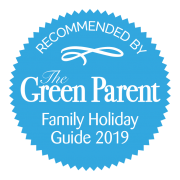 We firmly believe that concern for the environment makes sense, not only for the environment but also because it saves us money allowing us to continue to provide excellent affordable family holidays whatever the time of year. Our current plans for 2019 include reducing our plastic waste even further across both the farm and the holiday cottages. Single use plastics is a huge concern across North Devon and we will be looking for many ways to support the global, national and local efforts as well as raising awareness of this issue among our visitors. 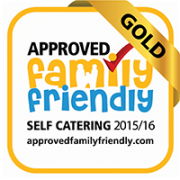 Since our main focus is on very young children often experiencing their ‘first proper holiday’ we understand how much enjoyment can be added by earning special reward stickers. Simple tasks such as encouraging them to turn off their own lights, saving water and avoiding food wastage (bring your scraps to us at feeding time and we will check what our animals would love to munch through) are just some of the ways in which you can help. We have designed our own `Green Stickers` to collect during their stay and welcome your use to reward their efforts. We invite you to help us further by shopping locally or having farm days on site. We have some amazing local produce to discover which you can even order using local online services (see Local Farmbox who will deliver to your door). 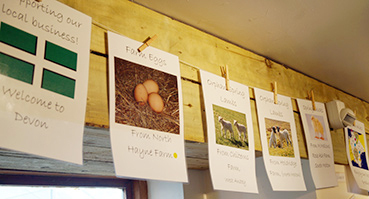 Farm days on site can be fun with one of our ‘welly walks’ or ‘sensory trails’ around the farm. And not forgetting jogging or cycling around our quiet local lanes. If you do decide to go out please consider borrowing one of our #2minutebeachcleanbags and make a bit of fun encouraging the children to think about litter around them (gloves also available! )..and finally please have a go with our own farm made 'wax wraps' and let us know how you get on-feedback has been great so far. Join an organised beach clean during your stay-they are great fun! Between March and July if you do happen to end up with used 500ml plastic bottles then please dont throw them- save them for us to use during bottle feeding sessions with the lambs :-)..another great way to re-use our plastics as many times as we can before recycling them! Thank you for helping us, we welcome any further ideas you may have.